Sydney siders and Australians at large are vastly embracing Latino culture whether it’s opening up shops and cafes with South American food or live music venues embracing the rich musical heritage of Latin America. Colombian culture in particular has a rich history of music and dance; it is a culture that has incorporated music from all around the world, from contemporary Caribbean rhythms like Ragga and Reggae to indigenous music, hip-hop and jazz mixing all these genres with its own traditional styles into a colorful creation of beats and influences that highly simulates the senses. Colombia’s most renowned style of music is Cumbia which is rooted in the indigenous music of the country but easily adaptable as other musical formats, something one of Jazz’s greatest composers Charles Mingus recognized when he visited Colombia and was captivated by the music’s raw energy and its roots in the African diaspora. Cumbia has no borders, it is universally social and embraces all walks of life. Sydney band Cumbiamuffin is a very creative14-piece band of talented Australian and Colombian musicians fronted by Colombian singer Angela Rosero and like Mingus’ 1977 album but in much more contemporary style their aim is to give Australian audiences a luscious taste of Cumbia and Jazz fusion. 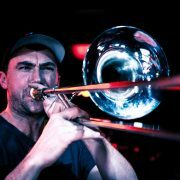 As part of the 2017 Vivid Festival Cumbiamuffin played 2 shows at the 505 Jazz Venue in Surry Hills. On the 16th of June the last weekend of the Festival you could escape the cold winter night in a welcoming room with comfy couches and tables with what can only be described as music to get warmed up to, a small but lively audience was ready to party the Colombian way. CumbiaMuffin are a musical force bringing Colombian folk and authentically singing only in Spanish but for an English speaking audience. The stories of their music lie within the compositions themselves as they reveal the history of a rich music that has travelled not only across Latin America but also all over the world including Australia where a proud Latino colony resides. Cumbiamuffin wasted no time getting up on stage and filling the room with their infectious and hypnotic grooves. “This is music to move your hips to” said Rosero and it certainly did get the audience up of their chairs and onto the dance floor shaking their hips without hesitation. The crowd was a mix of young and old, proving it’s music that people of all ages and nationalities can enjoy. Much like Jazz, Cumbia music can also lend itself to improvisation and the musicians on stage were able to maintain the rhythm whilst jamming with their song structures, stretching the time out and improvising fast rhythms and funky grooves. By this stage the dancefloor was packed, couples and friends were partnering up to dance and it became more of a carnival atmosphere than a sitting down on a confortable couch and drinking a fancy cocktail type event. Of course there was a big call out for an encore and Cumbiamuffin gave the audience one last Colombian shakedown before saying their goodbyes. Angela Rosero thanked everyone for coming out and announced she would return to the 505 for a solo show. Daniel is a fan of all types of music and has passionately followed all the great bands from past and present. As an aspiring music journalist, he actively writes and contributes for several publications and is also the author of "Thinking Critically About Culture" where he tends to explore broadly into cultural topics.